Looks like a sweet program from what I've seen so far. Have looked at some videos. Pretty gud stoof. Can't get logging in to work. The instant I assign myself a name, the console spits out the message "JangoCF (Shrooblord) left: Connection dropped by remote peer." Do you have any ideas on what could be causing this? I think it's because this code is too old for newer web browsers, causing the WebSocket connection to fail. With "the console" do you mean the one on the webpage or in the terminal window? Any other messages? I really want to rewrite WebJCS from scratch, but with a full-time job it's hard to find enough time for it. btw, I'm still happily using WebJCS 1.3.3 on my home network, and it still works perfect on my Chromebook as well. Collab is turned off here so I don't know if that still works. Keep in mind though, company/school networks are usually strictly firewalled which may also cause problems with Websocket. Just so you know that there are more people appreciating this project! Sneak peek of WebJCS 2.0, a work in progress. Playing with layer view modes. If tiles look messed up, try disabling the WebGL renderer in File > Preferences, then reload page. Not much to do yet except scrolling, zooming and changing layer view modes. I'm working on it! Last edited by djazz; Jan 24, 2017 at 09:51 PM. The noted features work for me with WebGL on in the latest versions of Chrome and Safari. X-Ray view plays nice in action! Please do test with Firefox as well. Some people don't want to use memory hog called Chrome. //edit: and please put it up on GitHub or something. So it can be developed faster by more people and so someone else can host it if for some reason you won't be able to do so in the future (I don't think we want to lose such a great tool, do we?). and please put it up on GitHub or something. So it can be developed faster by more people and so someone else can host it if for some reason you won't be able to do so in the future (I don't think we want to lose such a great tool, do we?). So, almost like, the link called "WebJCS on Github" that's already present in the Help menu? Seems to run fine in Firefox right now. Later, you will be able to download and install WebJCS as a regular program. If you're on Arch Linux/Manjaro/Antergos, you can install it from the AUR. When running it standalone it uses Electron. It also have read and write access to files directly on your drive, just like JCS. Some help with development would be very appreciated! I have been doing this solo for too long. You can now edit the tiles and save it to J2L. Use B to select tiles in the layer view. It's not perfect yet, will make it work like in JCS. 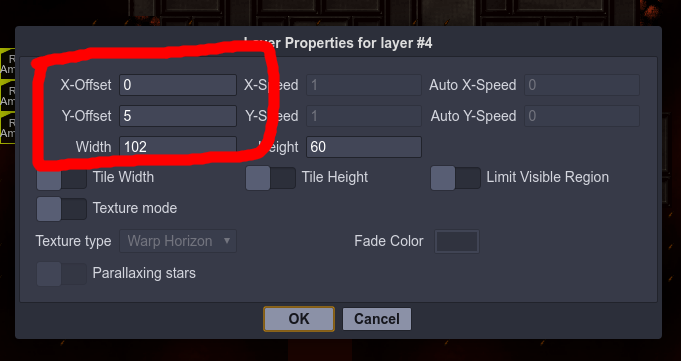 Animations can't be selected atm, only from tileset and layer. There is also a separate mask togglebutton for the layers. Horizontal and vertical tile flipping is supported (use plus to see result). New WebGL renderer that should be more robust and compatible. Layer properties and level properties dialogs have been added. Last edited by djazz; Jan 31, 2017 at 01:36 PM. Probably not a good idea to use on layer 4, because mask and events don't get moved. Use this to for example offset layer 5 by half a tile. EDIT: Turns out it is an undocumented JJ2+ feature. Ah well, plus only then! Last edited by djazz; Feb 5, 2017 at 12:28 PM. Nice progress! But since in the end it will be just another exe app, what's the point in doing it in html5 if it won't be actually fully usable on the web? Wouldn't making it as an SDL or Allegro app be better? Or if you don't like C++ for some reason, C# with Monogame? Advantages to it being web is that you can quickly share a link to invite to collaboration without them having to download and install the application. Easy access is important I think. The only features that the web version will miss out on is local file system access and the ability to run the level in JJ2 by hitting Ctrl+R. Basic collaboration have been implemented! To try it, go to http://webjcs.djazz.se and click Collab > Join/create session in the menu. Enter a name for the session and click OK. Open another browser window and repeat the steps, make sure you use the same session name. Or invite a friend. When you close all pages the session gets destroyed automatically. Only drawing tiles are synced for now! Starting a new session will use the current level you are editing. Joining an already created session will overwrite your current one with the one from the server! Djazz, or consider a nodejs/electron build if you want to build a standalone app, it required little porting and runs any common os today.